Isotopes are atoms of different weights of a specific element, based on the different number of neutrons in the nucleus. The analysis of stable isotopes such as carbon, nitrogen, sulphur, strontium, and oxygen can be used to study past human diet and mobility. Isotopes enter our bodies from what we eat and drink and are incorporated into the bones and teeth at different times in the life cycle. Bones are remodeled during an individual’s lifetime and the isotopes in bone collagen will reflect at least the last 10 years of an individual’s life. Isotopes in dentine or enamel of teeth are incorporated when the tooth is formed so the individual’s age for the event varies dependent on the tooth, as well as on which part of the tooth is analyzed. This way an individual’s diet can be assessed at different life stages depending on the items analyzed. 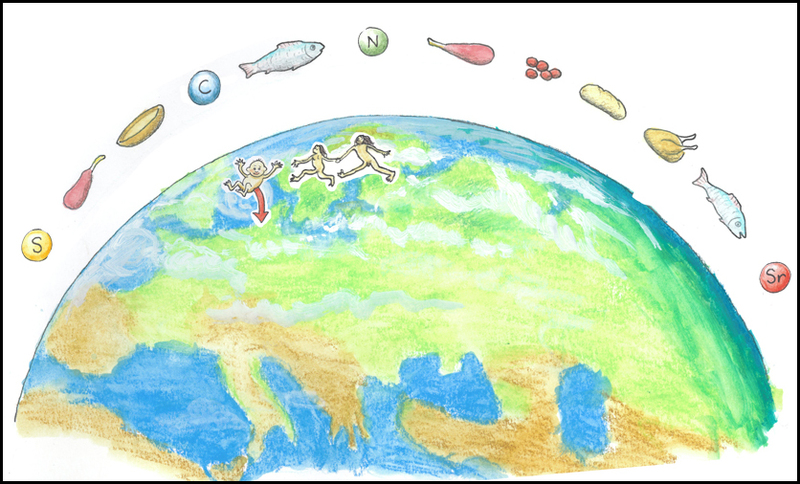 Human food choices are culturally defined in an environmental framework, with dietary patterns being highly dependent on ecological constraints, particularly in the case of past populations. Carbon and nitrogen stable isotope analysis of human remains from archaeological contexts is a scientific method widely used for assessing past dietary patterns. The method is based on the observation that the isotopic composition of human tissue, such as bone collagen or tooth enamel, largely reflects that of dietary protein. Additionally, the method recognizes that classes of dietary resources (i.e., plants, herbivores, omnivores and carnivores) have characteristically different isotopic ratios, and present a systematic difference between the isotopic composition of the consumer and the ingested food resource (i.e., fractionation factor). The ratio of 12C/13C (δ13C) is used to identify terrestrial, marine and lacustrine food sources, whereas the ratio of 14N/15N (δ15N) will display the trophic level in the food chain of the proteins consumed. Nitrogen fractionation occurs at about 3 ‰ at each level, where plants are around 3 ‰, herbivore land animals around 6 ‰, and terrestrial top predators such as humans and carnivores will have the highest values in the terrestrial food chain of around 10 ‰. A marine environment contains more trophic levels and a top predator can present a much as 21‰ which also will affect the δ15N-value of a human with a diet based on marine resources. Because of fractionation, a child that is breastfeeding will have a higher δ15N-value than that of the mother. The comparative analysis of dietary patterns can reveal social aspects of the lifeways of past populations. This is highly relevant for archaeological research because it offers a tool to discuss past relations to food at various levels, such as weaning, gender and age, culture, group identity, and differential access to food resources. Strontium, sulphur and oxygen isotopes can be used to study mobility by the identification of local and extra local (migrants) in an archaeological context. Strontium ratio (86Sr/87Sr) does not directly reflect diet but the age of the rocks in the region. The strontium from the geology of the area is absorbed by plants and integrated in the food chain, which is incorporated in the enamel in the teeth during their formation. By comparing the ratio signal with the geological background of the area it can be shown if the person is from a local origin, and can thus be used to make inferences about human migration and mobility. Sulphur isotopic analyses on bone collagen or dentine can be used in a similar manner. However the ratio of 32S/34S (δ34S) will reflect not only the signatures from the local bedrock, but it can also be used to study dietary patterns. Oxygen isotopes are typically used to reconstruct paleoclimate (e.g. ice cores, lake sediment varves), but can also be applied in archaeological research. Oxygen isotopes enter the body from the water we drink and are incorporated in the apatite in our skeletons. By analyzing the ratio of 16O/18O (δ18O) we can find if an individual comes from a warm or a cold climate. In a similar manner oxygen isotopic analyses of shellfish from shell middens, can be used to reconstruct the local temperature at the time the midden was formed. Of importance for all of these types of analyses is to have a local and temporal reference panel of terrestrial, marine and lacustrine fauna, as well as signatures of the local bedrock and water in the case of strontium and oxygen isotopic analyses.